Looking for a budget meal this week? I made this Poor Man’s Stew for $6.24 and it feeds 5 people! 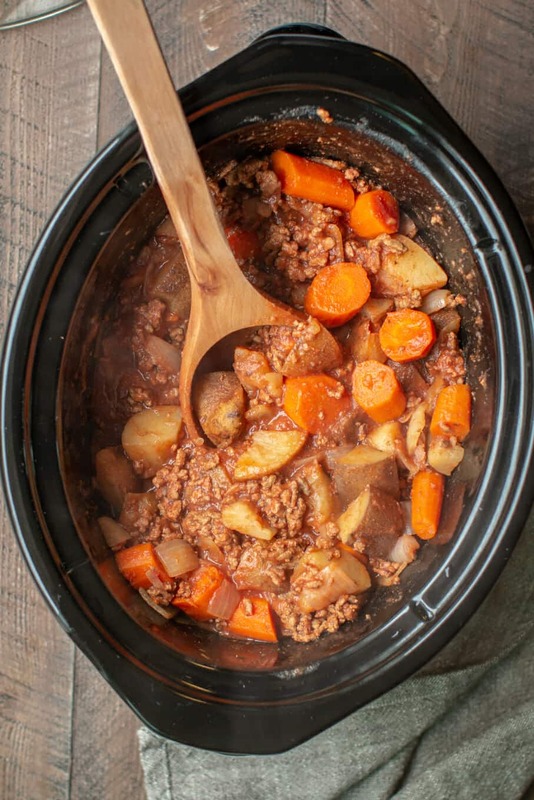 I put ground beef, russet potatoes, carrots, onions, a garlic clove (not pictured, I had this on hand), tomato paste, water and seasoning in my slow cooker simmered it all day to make this Hearty Poor Man’s Stew. The inspiration for this meal came from my favorite old movie The Princess Bride. This week I finished the book As You Wish- Inconceivable Tales from the making of The Princess Bride by Cary Elwes (the man in black), a fantastic read if you are a big fan of the movie. My husband and I watched the movie again after we both read the behind the scenes book, and had quite a few good laughs knowing what the characters had been through during the scenes. I made a stew similar to the one seen in the movie where Fezzic (Andre the Giant) hand fed Inigo Montoya (Mandy Patinkin) a hearty stew trying to get him sober, so they could go find and save Westley. 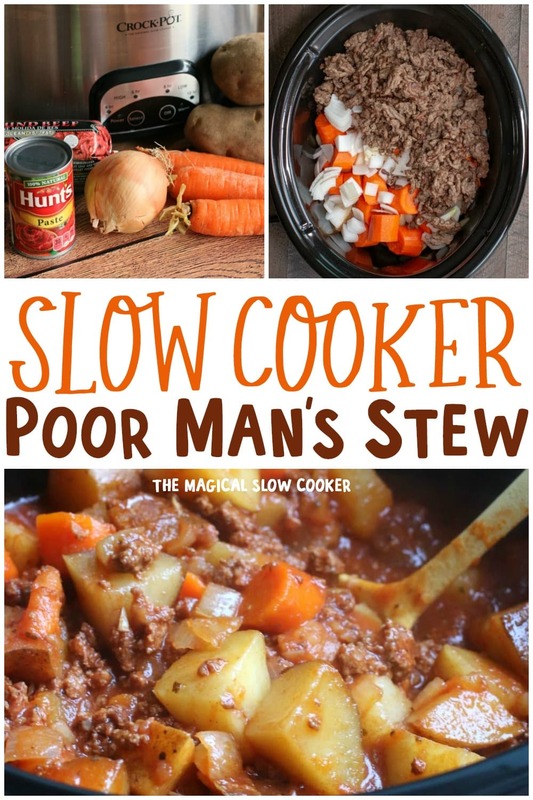 If you haven’t seen The Princess Bride, you will still love this budget Poor Man’s Stew. Not only is it cheap, it is very easy to make and really hits the spot. I recommend serving this stew with regular loaf sandwich bread slathered with butter. Enjoy! 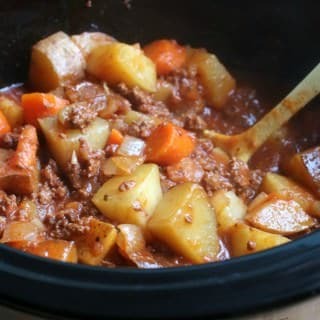 Below is the YouTube video about how to make this Slow Cooker Poor Man’s Stew. You Can follow me on YouTube, here. Cover and cook on LOW for 7 hours, without opening the lid during the cooking time. Serve with buttered sandwich bread. Enjoy! Thank you for sharing the recipe. I’ll be making it this weekend. I am making this, this week! It looks and sounds delicious! This is a very easy recipe to put together but I must say the taste was extremely bland even after adding the spices. If you make it, you may want to dress it up a bit. Maybe that is why it’s called “Poor Man’s Stew”. I made it with beef broth instead of water and added a packet of dry onion soup mix and a ranch seasoning packet. Cause I thought it was a little bland as well. Adding those ingredients seemed to add quite a bit of flavor! So I’m currently making this for today’s dinner and did add the beef broth. Hoping that’ll do it justice but as someone who loves making puertorican food I’m thinking of adding a packet of Saźon, a tbsp of homemade sofrito and a tsp of chopped cilantro. I will post a pic after the meal is done. How much beef broth did you use? I am so making this. Thanks you for yummy recipes and a wonderful blog to read. Thanks for sharing. 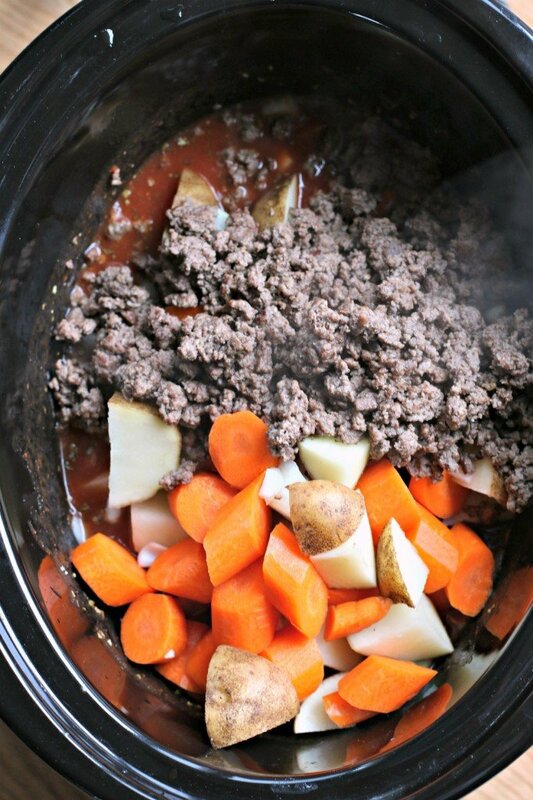 brilliant idea to make the stew with ground beef. Sounds good to me! Hubby loves meals like this one. Hearty and satisfying! I am going to make this on the weekend. I’ve been hungry for some comfort food and this looks perfect! What a great recipe, Sarah! I love inexpensive, hearty meals like this!! I love meals where everyone can be satisfied for under $10! Great recipe, thanks for sharing! I also noticed the price of ground beef?? but then all beef has really rose in price here on the east coast! I’m going to use stew meat, I know the simmer time should be fine, but should I add extra waters or beef broth?? There is quite a bit of liquid in this recipe, it should turn out great. I was thinking there wasn’t much liquid, also. I just made the recipe and put it in the crock-pot. I actually did add another cup of beef broth. I will check on it after the 6 hours and see how it looks. Thank you! The starch from the potatoes in the recipe should be enough to thicken the broth. Can I use ground turkey ? I know others have with luck! Is it okay to keep it on low for 11 hours or will it over cook? I have long workdays and would like to put it on before I leave in the morning and have it ready in the evening. The longest I would cook this type of recipe is 8 hours. Next time you are in the market for a new crock pot, I highly recommend one with a timer. So many more recipes can be made with it! You are so right Sarah about the new cockpots with timers! No 2 crockpots cook alike either so experiment a little and you’ll find how long you can cook different things. No more than 8 hours for this recipe because any longer would turn potatoes to mush. I used beef broth instead of water and didn’t find the need to thicken it. Our beef prices here in Arizona are higher in rural areas than in the city. I bought 80/20 ground beef and butter ball 93/7 ground turkey on sale and mixed it together when I cooked it. Wow great flavor. This dish is a keeper! You could set your crock pot on a timer. That is what I do. I bought a timer you plug into and set it to come on so it will be done when I get home. if you use a timer, don’t you have to let your ingredients set in the crock pot? is that safe? I leave for work at 7:30 am so if I would set the timer for 9:30, the hamburger has set out for 2 hrs. It will still be fine. The crock pot will keep it hot, even when it’s off. Thanks Patricia! I’ll fix that. One of my absolute favorite movies!! I never get tired of watching it. Everyone in the cast was perfect! Thanks for telling us about the book. I’ll have to get it. In the crockpot now but with ground turkey breast since we don’t eat beef! Looks great! I made this on Friday and you talk about delicious! I added more garlic and instead of water used chicken broth/stock. This is a keeper. Thanks so much for sharing this one! Would ground turkey work with this? TIA! id like to use 2 pounds of beef because we always need left overs. Do I need to change anything else for the extra beef? Yes, I often use ground turkey, it’s very good. I think it may work still, if it looks dry maybe add some beef broth to stretch it. This was the bees knees, so delicious, rich, tasty, so full of flavor…. hard to believe it was so inexpensive ! I’m so excited to try this, I just put everything together & can’t wait to start it in the morning! This is my first crockpot meal ever! For the person who has to work extra long hours, do the beef the night before and put it back in the freezer. Use ice cubes instead of water, and leave the vegetables larger. This should make longer hours of cooking okay. Just curious……..the top of the recipe says cook for 5 hours, while the bottom says 7 hours. Is 5 long enough? Thanks. Thanks for letting me know. I fixed it. I think 6 hours would be best to insure the potatoes and carrots get tender. Thanks for the fast reply. I checked after 5 hours and it still needs another hour…can’t wait! This was Delicious!!!! I added a can of cream of mushroom soup to the hamburger meat after draining. YUM!!! just want to be clear, are all the ingredients cooked before you put it n or just the ground beef?? This was just ok for me. If I were to make it again, I’d use a pound of potatoes and make up the difference with more carrots. I used very small red potatoes (about 2 inches diameter) and I quartered them. I set the cooker on high and it took 7 hours for the potatoes to get done. I don’t think I will make this again, sorry. Paste. Thank you! I will fix that when I get home! The recipes states it’s 5 servings. How much is a serving (i.e, 1 cup, 3/4 cup)? I don’t have that info, sorry! I just approximate how many people I think the recipe will feed, I don’t have the time to measure out recipes right before serving dinner. Looks great can’t wait to try. Pinned for later. It is a very yummy meal. My boyfriends family has been making it for years. All tough they call it cowboy stew, and they use ketchup instead. Ketchup instead of tomato paste? If so how much? Looks like a great base recipe but I’d want to add some frozen and/or canned veggies, such as kernel corn, lima beans, peas, mushrooms, etc. That way, it would be a complete one-pot meal. I’d also add one can of crushed tomatoes, or even Rotel tomatoes for the extra kick. The possibilities are probably endless once you have a base. It doesnt look like hou can go wrong tweaking to your own tastes. What part of the country do you live in? Hamburger in Texas is $4.99 a pound! I live in Oregon. It has been pretty spendy recently here too. Cannot wait to try it … Love simple , hearty and satisfying meals . I’m drooling just thinking about it ! Its in the slow cooker right now ! cant wait till its done ! My slow cooker is 4 quarts. Is there any way to reduce this recipe to make it fit? I think it may fit, but may be tight,. I would add a few less potatoes if it didn’t fit. What can I substitute tomato paste with? I don’t have any on hand? I have beef stock? Ketup? Is there a good substitute? I plan to make this some next week. I love to use my slow cookers & love the recipes here! I saw the comments about the cost of ground beef and it is expensive in the store. I buy my 93% lean hormone free natural ground beef from Zaycon. I think it is around $3.77 lb now. They cut out the middle man & deliver by truck. I know this sounds strange, but they are very popular & have been shown on several news shows. It is the best tasting ground beef that I have had in a long time. The bad news is that you have to order a case of 40 lbs. I heard about this on a money saving coupon site that I belong to. A lot of the people just split the order with family & friends. I have a freezer & food saver. I cook about 10 lbs & make 1 lb frozen packages that are ready to add to spaghetti, lasagna, or recipes like this that call for cooked meat. I freeze the rest in assorted ways. Some into patties for burgers, 3lb packages for meatloaf, 2lb & 1lb packs. Their boneless, skinless, chicken breast are also amazing & stay very moist when cooked in the slow cooker. Their website is http://www.zayconfresh.com. Don’t forget any kind of ground beef can be de-fatted especially in a super flavor packed recipe. After you brown, place in and rinse with hot water. The fat is gone! Works great! I learned this trick from a RD friend of mine… Same with turkey, as long as you add good flavor, no one knows!! Made this for dinner tonight and served it with homemade bread…FABULOUS!! I subbed ketchup for the tomato paste and beef broth for the water. So happy there are leftovers. I didn’t have time to put this in the crockpot so I just browned the beef, added everything else, brought to a boil and simmered for 45 minutes….easy peazy! If I cook on high how long do you think it will take? I’m making this right now. I only had the ground beef and seasonings so I had to buy the potatoes, carrots and paste. It came up to $6.91. The potatoes were the most expensive thing. I too had to add more water. And on the seasoning I added extra because there wasn’t much flavor. But in a few hours we’ll see how it turns out, can’t wait! So good! I doubled everything, but I will have leftovers for a while! I don’t usually do leftover, but definitely will with this! I make this myself but with other veggies, mainly because I was tired of the regular stew but wanted a hot meal for my children. I call it my Italian stew! The only difference is that I add shell pasta close to when the potatoes and carrots are done. I added mushrooms and doubled the seasoning and water. Great ideas! I’m sure it will taste amazing! I’m so interested in making this with sweet potatoes – either all sweet or half russet and half sweet potatoes. Thoughts, anyone? I’ve done that and it’s great. Sounds great Ashley! If you change your mind about the corn, it can always be stirred in at the end, I often do that. Made this and it was wonderful. ….making it again tonight, but do you think I could put it on high. …and if so. …for how long? Made Poor Man Stew today . l used have sweet potatoes and hafe russet potatoes . It was very good! Will make again. Thank you for dropping by to tell us the results. I’m going to try that next time. If I don’t have 6 hours to cook this can I set it on high and do it for maybe 4 hours?? I think that would work fine! Just don’t open the lid, so the veggies will get tender. 1) i have omitted the carrots to fit my family’s taste (i dont know whats wrong with thwm! Lol) and added other veggies, such as corn or peas or green beans.Tastes great and i use the frozen bags. This recipe is also great to just toss in any leftover vegetables into (even broccoli or squash!) It ends up being like a vegetable beef stew. Sometimes need to add the non root vegetables in towards the end (last half) of cooking time, also more liquid may be needed. 2. Vegetable, Beef, or chicken broth/stock are great substitutions for the water. 3. One time i accidentally bought the Italian seasoned tomato paste. It was so good, and i didnt need to add the oregano, that now i purposefully buy the seasoned paste. Saves me a few seconds in the kitchen. 4. I cut the veg up in much smaller pieces since i have a toddler. This makes it cook faster. Also, ive cooked this on the stove top. Since i diced all the veg, nice and small, i was able to cook the beef add the veg and everything was cooked within an hour. I let it simmer (to really get the flavors incorporated) for another half hour and it was just a great as the slow cooker version. So if you decided to make this last minute, it takes about 2 hours from cooking the beef to eating it, if you do it on the stove top. 5. Ground turkey or chicken work well. Also, i dont always add the amount of meat this calls for…i usually add a lot less…and its still just as hearty and filling. Overall this is a great and versatile recipe that you can customize to your family’s taste and diet preferences…and so budget friendly! Can this be frozen ahead of time like other crock pot freezer meals? Ground turkey works fabulous in place of beef in pretty much anything plus its cheaper than ground beef. You can get a tube of name brand ground turkey at Walmart for around $2.25. I would like to make this but replace the beef with chicken breast ( then shred it before serving), and use chick stock instead of water and add corn. Do you think it will be okay? No one likes what I make anyway so I have nothing to loose…lol. Making this now and can’t wait to try it! Adding corn, peas, and any other veggies I have laying around. Can never have to many veggies, and helps stretch it. Definitely an inexpensive meal which is great for us! Ground beef here is $2.99-4.29! I used to think it was high, but now I see we are lucky to have cheaper beef here! Thanks for sharing the recipe and I look forward to trying more of your recipes! I can’t wait to hear how it turned out! Corn and peas sound great! Made this the other night and this recipe needs alot more seasoning.. Very bland. This turned out great! The only changes I made were beef broth and baby carrots. I only cooked for about four hours on low. Plenty of liquid. Delicious!!! This stew looks delicious! I’m afraid, though, that I still haven’t caught my breath from the very thought of someone never having seen The Princess Bride! Thank you for sharing on Meal Plan Monday! I got a late start this morning, can I cook it on high for 4-6 instead of low for 6-7? Perfect! Well see how my husband likes it! Seems like it would taste very tomatoey with all of that paste. Does it? I wanted to make this on stove top like my dad use to to. I just figured an hour’s time. I am 52 yrs. now and I still remember how good this stew was when I was 7. My dad used lots of green beans and some green peas to this exact reciepe. Loved it then and still do. Thanks for posting since I had lost the reciepe and couldnt quite remember how simple it was. I made this before and it came out very dry. Should I double tomato paste and water??? Or add some beef broth? I just wanted to let you know that I made this a couple of months ago. I froze the leftovers and we reheated them last night for supper (love pulling something out of the freezer on a busy night!). The stew was just as tasty as the first time we ate it (if not more so)! Thanks for an easy and delicious recipe! Thanks for coming back and letting me know how it was. So excited to hear that it reheats well after being frozen! Poor man’s stew has cabbage as the second most ingredient because it is so cheap. Look it up. Carrots and potatoes are also cheap. Cabbage is NOT a required ingredient. Could this be made with ground turkey, do you think it would turn out as good? My husband isn’t a fan of beef. I accidentally bought ground chicken a while back, could ground chicken be a substitute for the burger in this? I think it would be good! 9 hours later and my potatoes are still not cooked…how is noone else having this problem? I had the same problem the last time I made beef stew. Does anyone have any suggestions? Partially cook the potatoes first? I had this happen once. The only thing I can think of is that the potatoes are old? Maybe sat on the shelf too long at the store. Normally if I don’t peek at the food in the crock pot the potatoes turn out tender. This is a great recipe! I gave it a little more of a twist as I added a can of corn, pinto beans and stewed tomatoes with a can of beef broth added for extra flavor. It is a hearty and very satisfying meal. Hey, is the broth suppose to cover the veggies ? I have quite a bit of veggies so was just wondering how much broth I need. Thanks. I wish I understood why the cooking time for this has to be that long. I have very oten made something similar with a fraction of that time and it’s delicious! On low in the slow cooker? I think that would work fine! Keep the lid on so the potatoes get tender. 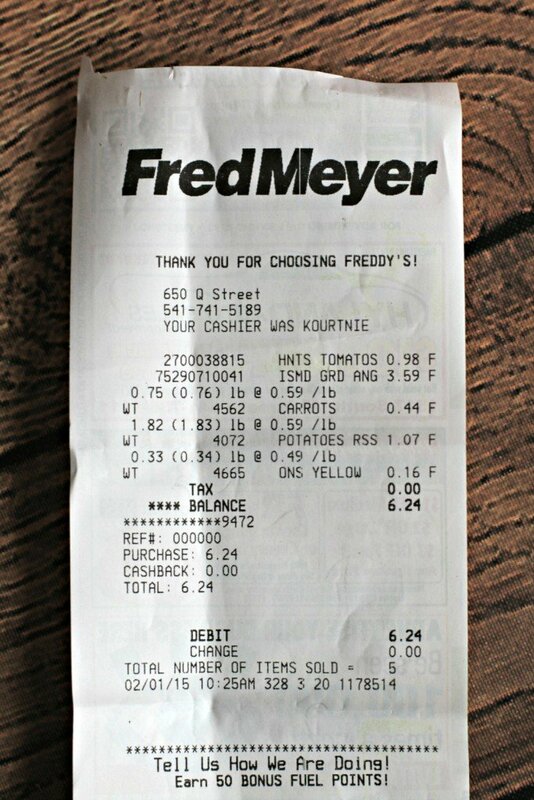 I live in NW WA and buy 3lbs of organic ground beef from Costco for $19. But, I will be using home grown veggies from the garden so that helps cut down the cost, and everything can be organic for less expensive.Growing potatoes and carrots is so easy if you have a little space! You can even grow lots of food if you have a sunny balcony or patio and a few containers. Tried your recipe tonight with great success. I did substitute stew beef for the hamburger and I used beef broth instead of water. Cooked on low for 7 hours and it was excellent. I use a 4 quart pot by the way. I think someone was asking whether a 4 quart would be too small and it was just fine. I just found your website and amazing recipes.. your a “local” facebook/pinterest celebrity 🙂 Awesome!! This recipe came up in my facebook yesterday so I tried it today. Followed the instructions to a t. What an absolute disgrace this was. Very few of the vegetables were cooked. Most were still hard. I have since reposted this and let everyone know what a sad disgrace this is. Worst recipe I’ve ever pulled off the internet. Did you leave the lid on the entire time? Or you crock pot can be cooking slow. Try cooking for longer? Fred, I understand your frustration. I had the same thing happen to me the first time I tried to make beef stew. It’s not the recipe, it’s the nature of slow cooking. 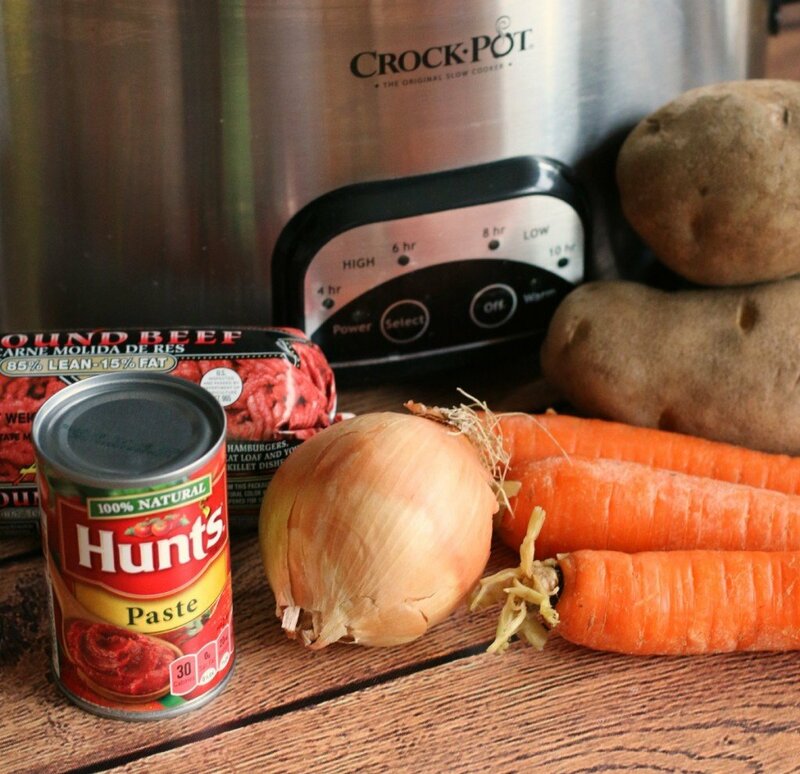 Carrots and potatoes are difficult to cook in a crock pot. You either need to partially cook them before you add them to the pot, cut them into very small pieces, or use canned or frozen veggies. Also cook on low for 8 or 9 hours, don’t try to cook on high because the shorter cooking time does not work. I made this recipe just last week and it was delicious. What a pity. I put mine on high for 2 hours, then low for 4 or 5 more and it was fantastic. Really, try again. did you leave the lid on the entire time? Your slow cooker may cook on the slow side if you did leave the lid on. My husband made this today, and it was absolutely wonderful. He used beef broth in place of water, and when the stew was almost done, he stirred in some Bisto for thickening and extra flavor. We look forward to making this dish many more times this winter. Thanks for the recipe! Made this recipe tonight. Followed it to a t. My husband was the first to grab him a bowl and was pretty excited about it because it looked so good. Needless to say, he was disappointed as it tasted like straight water. No flaver to it at all. Anything I can do right this minute to salvage it? Add more seasonings, salt, pepper, onion powder? Can I Put the ground turkey I’m using in uncooked and cook on high for 4 hours ? I’m not sure how that would work, I apologize! I made this today. I used ground venison and beef broth in place of water and used baby carrots cut in half..about half a bag. I also doubled the garlic. It was GREAT! Really, other than what I did, I wouldn’t change a thing! Thanks for such a great recipe! Sarah, it’s in the slow cooker now. I added fresh green beans. We’re looking forward to a yummy lunch tomorrow on a cold 62 degree rainy Florida day. Thank you for this recipe! I just commented in November, but my husband asked for it again! I’m changing it up using venison stew meat this time, and wild mushrooms I gathered and froze in the fall. I’m using my 4 quart crockpot thus time and everything first, but it’s close. Here’s hoping it doesn’t boil over. This one’s becoming a staple. For anyone complaining it’s watery, just use broth instead of water. Can you can this in pint jars?? Canning is such a science, I wouldn’t be the one to ask this. I think there has to be a certain amount of acidy in the recipe and I do not know the amount here. I was thinking of making but subbing ground turkey and sweet potatoes, do you think this would work? It would probably turn out fine, it will have less carbs and fat in it, so you may need to add more seasonings for flavor. What are my chances of doubling this recipe and stuffing it in a 6 Qt. Slow Cooker. I also have turnips, green beans, squash, and peas i’m hoping to fit. Hi Walter. I don’t think it would fit, but it would be a chance to make it your own and add all that you want to fit! Add extra sauce ingredients and seasonings and cook a bit longer than the recipe says. Oh and add the peas right before serving. They thaw out in less than a minute in the hot stew. O.K. Didn’t work. Next best thing. I’ve doubled the recipe, and am making this in two 6 Qt. Slow Cookers. My sons birthday today. We got him a Slow Cooker. So I am making this in his Cooker and the same in my Cooker. For some reason, his Cooker holds more than mine. Lets see…1-1/2 lbs. ground beef, 2 lbs. potatoes, 4 carrots, 8 oz. sliced mushrooms, fried. 6 oz. whole green beans, 6 oz. squash, small green pepper, 1 can, Cream of Mushroom soup. I had cabbage, but I forgot. Each Cooker took the same amount of food. Now I’ll see which one can cook this in 6-1/2 hrs. Have to add more meat next time. Oh. I forgot. A can of baby corn, and low sodium beef broth. This came out excellent! Both cookers took 7 hrs for the carrots and potatoes to cook. Lots of juice. Great flavor. Definitely a keeper. This is the best post I’ve ever stumbled upon! I love everything about it. The Princess Bride reference especially! One of the (many) reasons I knew my husband was the one was his ability to quote the movie to me at random moments. I’ve always wanted wanted to eat that stew from that moment! Your post just made my day! Thanks so much. I made this tonight and really enjoyed it. I couldn’t get my act together to do this in my slow cooker, so I did it in my pressure cooker. I just didn’t stir after adding the tomato mix (tomatos scorch under pressure). 13 minutes at high and fast release may have been too much, next time will try 10 minutes. Thanks again – so easy I will teach my 12 year old to prepare this. Thank you for this easy budget friendly recipe!!! I had everything on hand already and I used ground venison instead of beef (so that was free!!) I cooked my onion with the meat and I seasoned that with seasoned salt and pepper. I added celery in with the carrots and potatoes because I had it. I used ketchup instead of tomato paste and added onion soup mix with that the water and the other seasonings. It’s in the crockpot right now. I am cooking it on high with the hopes that it doesn’t take as long, as I didn’t get it going til later than I wanted to. 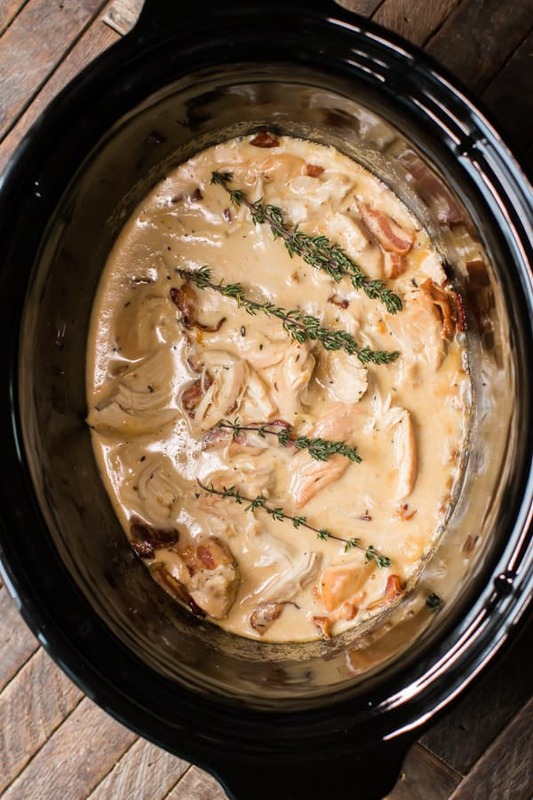 This looks like an awesome dinner idea–I’m looking to cook it for tonights dinner but do not have 6-7 hours; would you recommend putting the crock pot on high for 4 hours or is there a reason it needs to be on low? I think it will be fine on high. 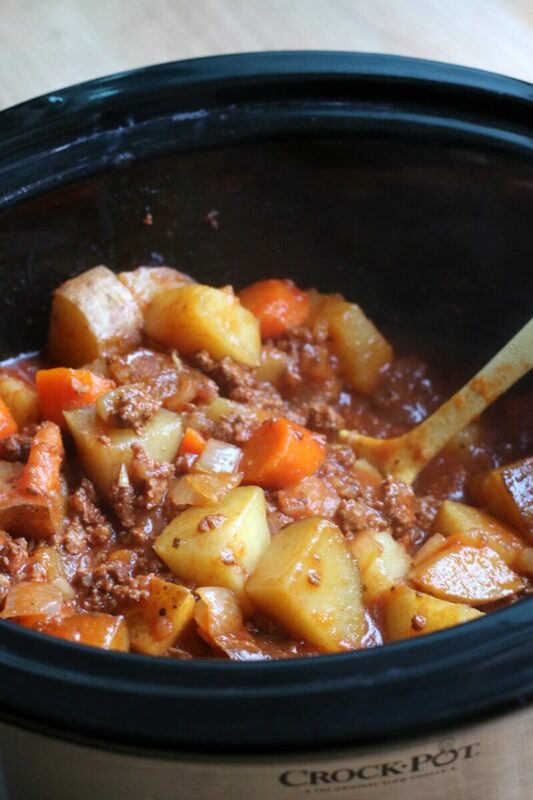 I have this in my slow cooker right now and it smells delicious! And as an added bonus, I spent less on mine than you did yours. I buy my ground beef in bulk and it ends up costing a little less than $2 a pound. I buy 10 pound bags of potatoes for $2.50, so the 1.5 pounds of potatoes were about $0.40. $0.88 for a pound of carrots and I used about $0.30 worth. The tomato paste was only $0.60. I had all the seasonings on hand (I just used onion powder instead of an actual onion because my husband hates the texture of onions) so I spent about $3.30! Can’t wait until this is ready. This is just Scottish “mince” as they call it. Toss the tomato paste and use Bisto instead. Slow cooker is a new twist though. We make it on the stovetop in a pot, and have for decades. Lovely! Interesting! I’ve never heard of Bisto! can the leftovers be put into the freezer? if so how long. This is very similar to a dish that my mother-in-law taught me many years ago that we call hamburger soup. The only difference is we use a jar of spaghetti sauce, and a little bit of water, (in place of the tomato paste), along with a can of corn. I’ve never tried it in the crockpot, though. What a great idea, Sarah! Thanks for making something we love to eat even more simple. Love this! That all sounds great, I will have to try it that way. cost me $17. I had none of the items. needs more salt when done. 1 tbl spoon was not enough. I’m making this right now. Seems like a good basic recipe. I did add a few extra/different things. I used 1 cup beef broth 1 cup water. I added a can of stewed tomatoes and some celery to it. I used Italian seasoning in it too. Can’t wait, it smells good already. Sweetie you may have inspired by some old movie to make this, but it has been around longer than you have been alive. Sweetie, you are incredibly rude! I’m much older than this movie, but thanks for the compliment! Definitely going to make this. Your recipe is very much like what we made “back in the olden days” at Girl Scout camp. Just think, I now use a slow cooker instead of a coffee can!! Thanks for the recipe and bringing back a memory. That’s a great memory Cheryl! I made this but substituted beef for venison and added 2 tsp garlic powder, 2 tsp old bay seasoning and 6 stalks celery. Turned out great! I make this a lot and it’s very popular in my house!! However 7 hours is WAY too long unless you want this to turn into absolute MUSH. I usually cook it for 4 hours and it’s great. This is one of those rare recipes I’ve found that frequently stays in our dinner circulation. I’ve been making it for years. Everyone thinks it’s impossible to eat healthy on a budget and this recipe begs to differ. Thank you! Thank you for letting me know. So great to hear! We love this recipe. The only difference is we add a few good glugs of Worcester Sauce once all the other ingredients are in (We are British and UK based and love the flavours Worcester Sauce adds to stews and casseroles). Thank you for this recipe!! I love what you did with the recipe! Is it possible to do this with frozen ground meat instead of cooking it beforehand? Cook it for longer maybe? I’ve seen recipes where this is done. It would probably be fine. Is there a faster way to do it? In the oven? Very hearty n good ! I made it in my instant pot! I browned the meat and then I cooked on high pressure for 12 minutes with a quick release! Also added one cup of boxed chicken broth to replace one cup of water for added flavor! It says it serves 5. How much is a serving? I don’t measure out the recipes, it’s 1/5 of the recipe.